Most drivers heading north across Rannoch Moor towards Glen Coe find their attention drawn to the rocky pyramid of the north end of Buachaille Etive Mor. 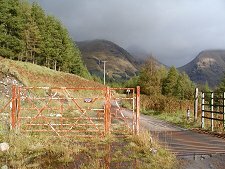 As a result many probably don't notice the nearby junction from which a single track road leads south down Glen Etive. 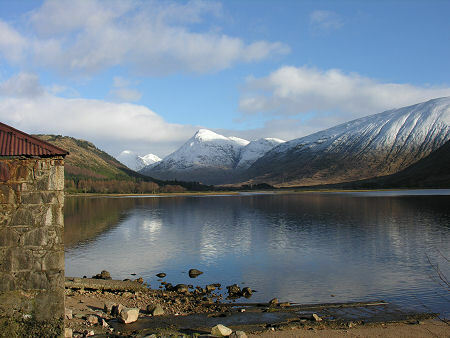 The Glen Etive road meanders for some 14 miles to the head of Loch Etive, where it ends in a turning circle near a pier. And that's it. The road down Glen Etive is the original "road to nowhere". It's not always been that way. In 1750 there was a track running down the south side of the loch as far as Taynuilt. And from 1847 a steamer service from Oban operated to the now derelict pier at which the modern road ends. 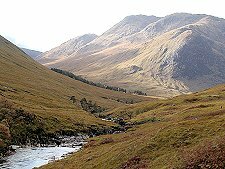 Glen Etive is a magnet for climbers and hillwalkers, who come here especially to climb the mountains around Ben Starav to the south east and the Glen Coe mountains to the north and west. Some people visit the glen to recreate a classic scene from the James Bond film "Skyfall". But others make the 28 mile round trip simply because it is one of the most beautiful detours in the North West Highlands. The scenery is simply superb. The first half of the Glen is a steady descent of an open heather-clad valley. 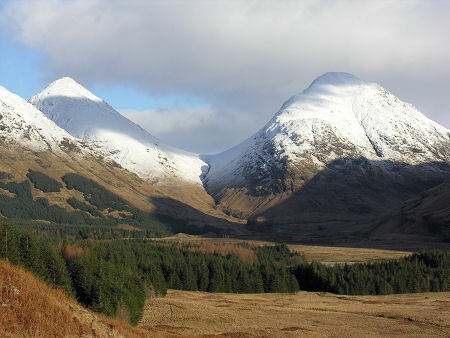 The character changes at the southern end of the twin mountain ridges of Buachaille Etive Mor and Buachaille Etive Beag. 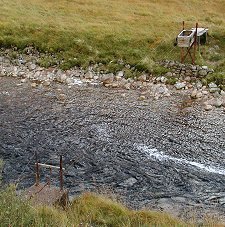 Here, near the large house at Dalness, is a junction with two of the great mountain passes of the highlands, the Lairig Eilde and the Lairig Gartain, both extending north to Glen Coe and providing the punctuation for the Buachailles, dividing them from one another and from Bidean nam Bian. The southern half of the glen is more enclosed and wooded, and all too soon you find yourself at the road's end. 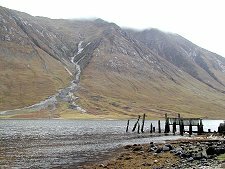 When we last visited there was a ruined wooden pier here from which you could look straight across Loch Etive to the steep sides of Ben Starav. Or enjoy the view back up the glen. 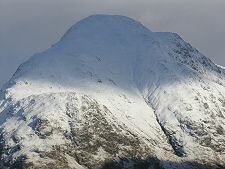 Here the chief attraction is Stob Dubh. 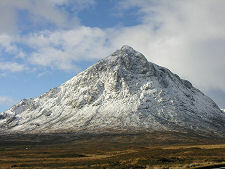 This isn't the highest mountain around the glen, at 883m, but it is the second most beautiful. 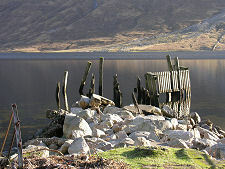 We are told the ruined wooden pier has been replaced by a stone one, and will update our images when next in the area. 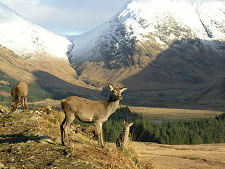 You find out which is the most beautiful mountain in Glen Etive on your return trip. Suddenly the views before you open out across the lower glen and you are presented with the sight of the southern end of the Buachaille Etive Mor ridge, with the Lairig Gartain to its west. If this mountain's northern end is unmatched for rocky splendour and mountain majesty, its southern end takes some beating for simple perfection of form. 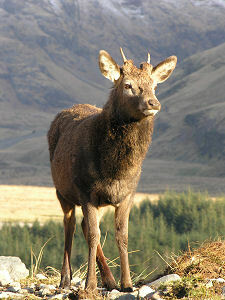 You return from Glen Etive to the high speed stream of traffic on the A82 with a sense of regret. You've been somewhere different, and somewhere very special and suddenly you're back in the modern world. But now you know it's there, you can always return, and probably will.